When the Mustang III was delivered to England, the RAF decided that the hinged cockpit canopy offered too poor a view for European operations. A fairly major modification was made in which the original framed hinged hood was replaced by a bulged Perspex frameless canopy that slid to the rear on rails. This canopy gave the pilot much more room and the huge goldfish bowl afforded a good view almost straight down or directly to the rear. It was manufactured and fitted by the British corporation R Malcolm & Co, and became familiar as the Malcolm Hood. The hood was fitted to most RAF Mustang IIIs, and many USAAF Eighth and Ninth Air Force P-51B/C fighters received the modification as well. 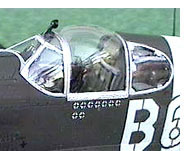 In search of a more lasting solution to the problem cockpit visibility from the P-51B/C, a P-51B [43-12101] was modified with a teardrop-shaped all-round cockpit canopy and redesignated XP-51D. Having proved that the concept was valid, two P-51B-10-NAs [42-106539/106540] were completed on the production line with Plexiglas bubble canopies and redesignated P-51Ds. Those became the prototypes for the famed P-51D series of Mustangs. Yet many pilots regarded the Malcolm-hooded P-51B/C as the best of the entire series. It was lighter, faster, and had crisper handling than the bubble-hooded P-51D and actually had a better all-round view. Its primary weakness was in its armamentonly four guns, which often jammed. Some modifications applied to the P-51D to improve the ammunition feed racks were later retrofitted into P-51B/Cs, which made their guns less prone to jamming. With modified guns and a Malcolm hood, the P-51B/C was arguably a better fighter than the P-51D, with better visibility, lower weight, and without the structural problems which afflicted the D. Emergency bail-outs were also easier.